I'm currently in the process of thinking about submitting another ESRC grant proposal. To date, I have put in a few but without success. I'm not easily discouraged though and I have had a lot of good feedback (but no money!). 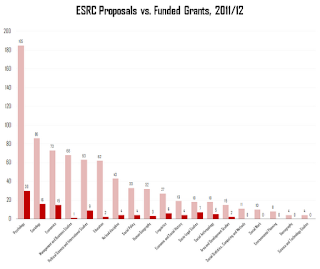 Thankfully, I have been able to secure funding from other sources but the vital statistics from ESRC do suggest that I might need to up my game considerably - or switch to Socio-Legal Studies! What am I talking about? Success rates of course. The LSE Impact blog just did a post on this issue and the figures really are striking. So striking, in fact, that I felt the need to turn it into a chart. Just look at the data (click charts below). 39% success rate for Socio-Legal Studies and 0% success rate for Environmental Planning (among others). 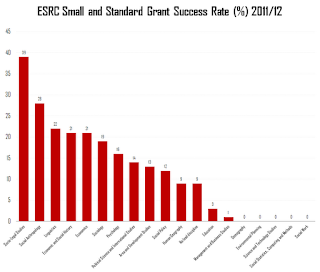 In relation to the number of submitted grants, Psychology is the clear category leader with 185, though the success rate in this category is just slightly higher than the average (16% compared to 14% average). The highest number of grants to any one category is in Sociology, with 16 awards (19% success rate) during the 2011-12 period. 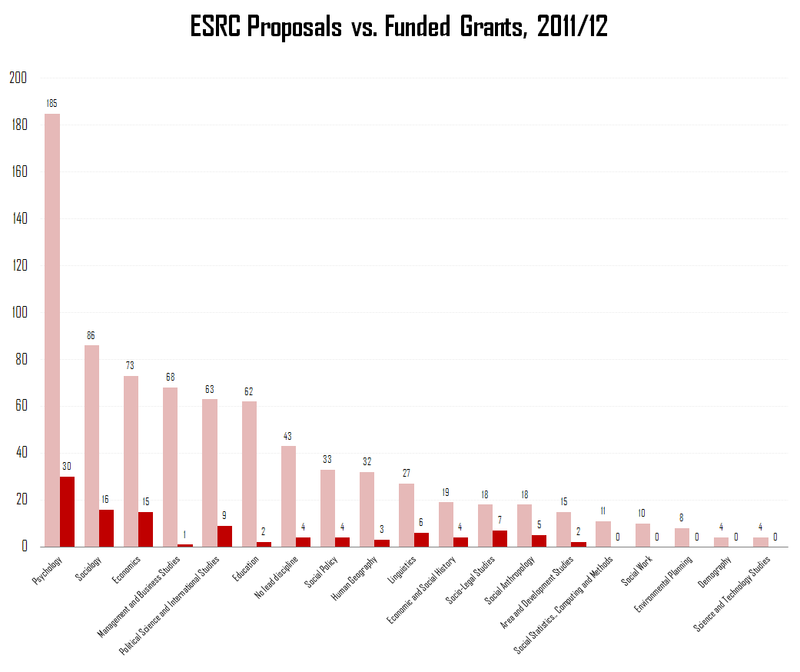 See the full ESRC report here, where you can also find a break down of the figures by institution.